Thus each suite is a private modern spa. The interiors have been inspired by the nature and traditional Cycladic architecture combined with modern design and the latest amenities. They all feature a private hamam, hydro massage and aroma therapy in the bathroom while Deluxe spa suites come with an outdoor private heated pool and Premium spa suites with an outdoor private plunge pool. 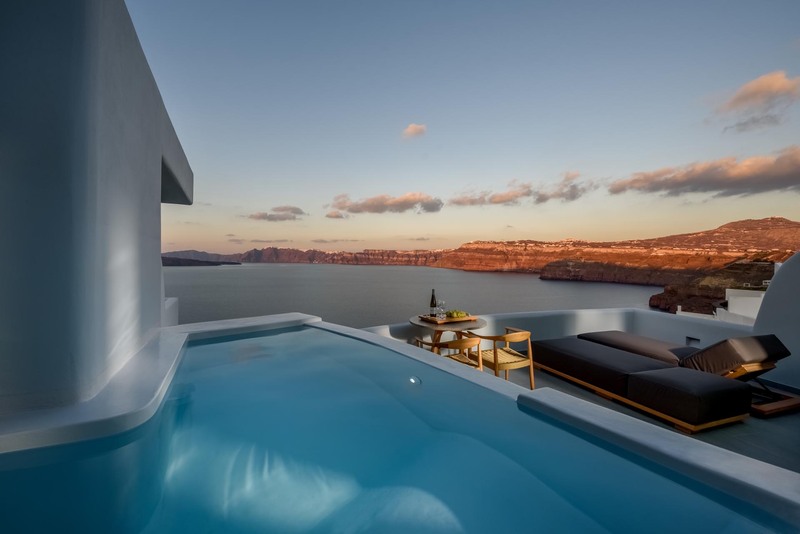 They all open up to private verandas with sunbeds and views to the caldera, volcano and Aegean Sea. Such luxury would be incomplete without services of a high standard. Upon request we can offer a wide range of massage programs either in your suite or on your private terrace. Start your day with a rich breakfast served at your terrace, the time of your preference. You can choose among three types of breakfast – continental, Greek and American – from our a Ala carte menu. We will be happy to arrange your transportation to our premises as well yachting and helicopter rental at an extra charge. We also provide laundry and iron service, porter service, travel desk, daily maid and wake up call service. Neptune Luxury Spa Suites is located in the center of Akrotiri, at a very quiet area away from the hustle and bustle of the city. The excavations of ancient Akrotiri are a stone’s throw away. The closest beach inside caldera is 150 meters away, but there is also a big variety of beaches nearby, such as the Red Beach. Many restaurants and traditional taverns can be found close to the hotel for you to choose from. Each suite is a private modern spa. The interiors have been inspired by the nature and traditional Cycladic architecture combined with modern design and the latest amenities. Neptune Luxury Spa Suites is located in the center of Akrotiri, at a very quiet area away from the hustle and bustle of the city. The excavations of ancient Akrotiri are a stone’s throw away. Start your day with a rich breakfast served at your terrace, the time of your preference. You can choose among three types of breakfast – continental, Greek and American – from our a Ala carte menu. Allow the romantic atmosphere of Santorini affect your soul and show your partner she/he is the only one, by asking us to organize a romantic candlelight dinner on your terrace with a choice of 3 set menus and butler service.